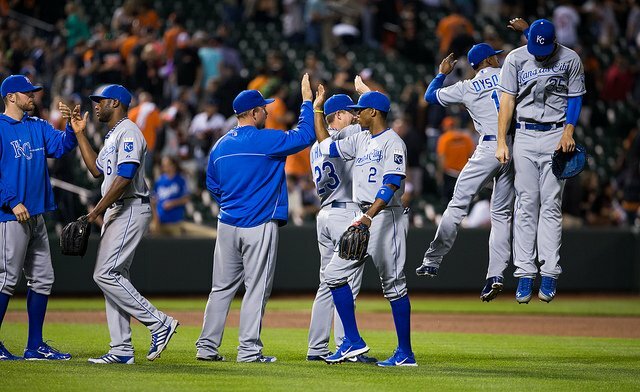 The Kansas City Royals clinched their first playoff berth since 1985 Friday night, beating the White Sox 3-1. Jeremy Guthrie pitched seven scoreless innings for Kansas City, they scored all three of their runs in the first on four hits. Kansas City will more than likely play the Oakland Athletics in the Wild Card game Tuesday, September 30 on TBS, the time has yet to be announced. Oakland beat the Texas Rangers 6-2 Friday night. 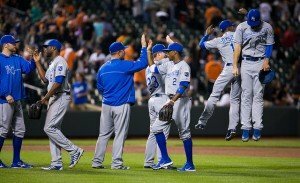 Kansas City ended the longest playoff streak in major North American sports leagues, the Toronto Blue Jays now have the longest postseason drought in MLB. The Blue Jays haven’t been to the playoffs since 1993 when they beat the Phillies in the World Series. Kansas City still has a shot at winning the AL Central with Detroit losing to Minnesota 11-4 tonight. The Royals are now one game back of the Tigers with two games left. If the two teams are tied for first after Sunday, they will play game 163 at Detroit. Guthrie (13-11) allowed just four hits, striking out six, and walking just one. Wade Davis gave up the only run to the White Sox in the eighth inning, when Adam Eaton tripled and Alexi Ramirez hit a single to drive him in. Greg Holland closed the ninth for the Royals getting his 46 save of the year, which is second in baseball to the 47 by Fernando Rodney of the Seattle Mariners. Chicago’s pitcher Hector Noesi (8-12) allowed those three runs in the first, but settled down after that, he ended up going six inning giving up six hits. I’m glad to see some teams make the playoffs this season that we aren’t use to seeing, it should make an exciting postseason. I think it’s one we will remember for a long time. On another note this is Paul Konerko last series as a professional baseball player, he went 0-4 in Friday night’s game. I will have an article about him and Derek Jeter Sunday.